Yeah. What a nice book. Thank goodness there are feminists at the controls as we enter the ecological—which is to say, truly post-modern (note the hyphen) era. This is a profoundly nonviolent, and therefore genuinely threatening, book. I was shocked by how Simon Critchley chose to enter ecological discursive space on the back of Roy Scranton’s Learning to Die in the Anthropocene: “We’re fucked. We know it. Kind of.” Do we? Do we know that? Or is that one of those lies in the form of the truth, the kind that show up in Blake’s Songs of Experience? And since when did being fucked count as the worst thing that could happen to “us”? And since when did being fucked equal the triumphantly horrified rubbernecking of one’s own catastrophe, which incidentally implies the horrifying extinction of actually existing nonhumans? And furthermore, since when did a deconstructor feel like resorting to an explosive monosyllabic slap upside the head (seven of them, actually in three “punchy” sentences), as if we needed any more slapping from any direction whatsoever, given what Anna Tsing says, absolutely accurately, about the current state of neoliberal play in this wonderfully playful yet serious, light yet strong, fleeting yet resilient, collective yet not communitarian mushroom of a book? A very particular mushroom, just like the very particular mushroom (the Japanese matsutake) that is its occasion. And that Kind of. The seven words think they can achieve escape velocity from the poor saps down below who only slightly know, or don’t know at all. Those fools. Male environmentalist writers have tended to want to distribute such head slappings in a spirit explicitly aimed with great hostility at what they mockingly call theory. It’s pretty shocking to find an otherwise great deconstructor doing it, as if that’s how one needed to announce one’s eco-entrance. Tsing is having none of it. The horror-aggression of We’re fucked is destructive agricultural logistics in full-throated tragedy mode (Oedipally “knowing it”), tragedy being how agricultural society computes (but doesn’t at all transcend) its operating software: OMG, I killed my dad! We need to find the laughter. Then perhaps we can cry for real. Out with the corn fields, bring on the mushrooms on the forest floor. This is a book that shows you how to live beyond the deadly concept survival (27–34), the one that started when wandering humans discovered a warming Holocene climate, settled down and rapidly generated autoimmune-disordered social systems, patriarchy, religion and what is now called the One Percent (otherwise known as King) in swift measure, followed an eyelash flutter of geological time later by steam engines, coal, oil and worse global warming than what we Mesopotamians encountered around 10 000 BCE. Survival has now achieved its global apotheosis in the Sixth Mass Extinction Event. Mushrooms are what happens next, after the “survivors” have blown themselves sky high. We’re already dead. Now we can start living for real. But that’s still Hegel driving with the brakes on, and as Carla Lonzi jauntily puts it, Let’s Spit on Hegel. But as Tsing puts it (I’m paraphrasing), Let’s bury Hegel under some leaves and watch the mushrooms growing out of his corpse, metabolizing the mercury and the other toxins in no time at all. It’s more polite than spitting. And this humble politeness is brilliantly political. Abject mushrooms are precisely how a Nazi children’s story imagines Jews. Let’s have loads of them then. “Our first step is to bring back curiosity” (6). Exactly. Horror is just the tail end of the literal scorched-earth policies of mass extinction. Our ability to think otherwise, to keep the future open, is collateral damage. Curiosity is a playful, possibly eroticized peering at ground level, far below the floodlights of the patriarchal-agricultural gaze, living like a small rodent after the dinosaur-wiping asteroid. Critique has collapsed into cynical reason, we think we know all the answers: “We’re fucked. We know it.” But cynical reason is impossible in an ecological era, because interdependence reduces every decision (cognitive, social or otherwise) to hypocrisy: there is no way to achieve escape velocity from one’s “living-space entanglements” as Tsing puts it (6), and that means not everyone can be included in one’s network—a one-size-fits-all format (again, in philosophical or social or psychic space) is impossible. As one rushes to protect the bunnies, bunny parasites get the thin end of the wedge. There is no way to get it “right”—and this book plays joyfully with this fragile predicament on so very many levels that one realizes one can’t find a one-size-fits-all format for a book review. The book mushrooms, bursting with pesky spores. Tsing rightly argues that current conditions confront us with a crisis of scale (37–43). In such a crisis, we can’t ensure that different scales can be made to match, and this, she suggestively then proposes, presents a crisis for capitalism itself, because it has tended to want to ensure that everything is exchangeably scaleable. What begins to emerge is a strange kind of uniqueness that she locates in the smell of the mushroom. This uniqueness is “present” yet “ineffable” (37). Tsing comes close here to the conclusions of object-oriented ontology: a kind of weird essentialism in which things cannot be reduced to other things, precisely because they cannot be posited as constantly present. And like OOO, she sees in this possibility a political promise, a promise for imagining collectivity otherwise. As a big fan of anti-ocularcentric writing, I was very impressed that Tsing follows up with an entire chapter on smell. Hardly any scholar talks about this sense, still. It is still abjected, reminding us of our creaturely embodiment and padding about on all fours, literally humiliated insofar as we are closer to the ground. And one can change one’s mind about a smell, as if the substance one was smelling had a sly persuasive agency: another disturbing phenomenon, disturbing to our modern categories of subject and object. Tsing thinks aloud about this “indeterminacy” (51–2). So ends part 1. And so begins part 2, a really innovative meditation on theories of capitalism. Part of the problem, as I have also been diagnosing it, is that these theories are as disempowering and totalizing as the entity they pretend to theorize. What if the truth were much more patchy? Might it not be a nice surprise that cynical reason was over, the mode in which I prove I am more intelligent than you because my overarching totality is far more hostile and difficult to dislodge than yours? Isn’t this just a retweet of monotheism, dressed up as critique? My god is bigger and badder than yours. Is that really what we want to be saying, especially considering that such sentences happen inside the logistical space of mass extinction? Evidently, mushrooms can make you more intelligent. Somehow the “big picture” is weirdly less than the sum of its hallucinatory, eye-popping parts. I call this idea subscendence and I think it’s what Tsing is aiming at in Part 2. I might want to argue a little bit with Tsing’s work on the concept of alienation. For me, wresting a thing from its lifeworld and putting it into circulation isn’t quite it. That definition is so wide that pretty much everything and everyone is in the alienation business, and the concept loses its edge. Neanderthals alienated shells by making necklaces of them; feudal markets also offer products of equivalent value. And the Nature-speak that the concept entails—alienation is denaturing a thing, distorting its natural place—happens on the inside of the social, psychic and philosophical space that Tsing elsewhere is nuancing massively: the space that makes nonhumans be in a homogeneous region “over there,” with humans and their equipment and “cattle” on the hither side of things. And this makes it hard to explain how such a rigid and thin boundary can ever be crossed—yet this is just exactly what Tsing has been exposing in her thoughts on what she calls translation, all the various go-betweens and conceptual go-betweens that need to match the social and physical ones; one model is symbiosis, as Tsing shows in an interlude called “Tracking.” When you deploy this particular concept of alienation and analyze anything up close, not just mushrooms, it won’t yield the fruit of alienation. So matsutake mushrooms aren’t really that special. This should tell you something about the efficacy of the concept when thought this way, which is about as useful as a chocolate teapot. But I honestly feel very reluctant to argue at all. On Tsing goes to part 3, which really brings the nonhuman noise. Scholarship is working hard to move beyond what Tsing calls “human exceptionalism,” which is just the right phrase (162). This is exemplary work. What is particularly significant is how, in true (rather than clichéd) Romantic fashion, getting close to the nonhuman entails reflecting on one’s experience, and on experience as such: a kind of looping that lends itself well to narrative, and this book is full of stories. It’s not the case that we promoters of the nonhuman are trying to extinguish the human altogether, or burst outside it. We are simply allowing nonhumans to be what they are, namely entangled with us in all kinds of strange ways, neither absolutely reducible to human access nor completely divorced from it. And nonhumans get to access us, and one another. Something like this already began to be implicit at the start of the Anthropocene, namely the Romantic period, in which as one scholar puts it the geologist’s hammer replaced the Claude glass, and artists came so close to the (nonhuman) thing that it began to lose its manipulable, superficially charming definition. A truly scientific attitude and reflexive, loopy narrativity go hand in hand, in fact. This is a book that prolongs this development, itself a kind of mushroom on (Or outside of? Or beside?) the surface of modernity’s undergrowth. Science itself, as Tsing argues in part 3, partakes of this weird loopiness (“Science as Translation”). This book is truly a Wordsworth poem—in contrast with the bombastic Nature-speak that pretends to inherit Wordsworth. So many artists appear to be mushrooming right now. Jae Rhim Lee has developed a marketable “mushroom death suit” made of paper saturated with mycelium trained to enjoy breaking down the body of its owner (by the use of bits of hair and skin and petri dishes). The suit digests one’s corpse ever so politely in two days, as one lies in one of Lee’s flat pack slot-together biodegradable cardboard coffins. Such a death is even more environmentally friendly than being chopped up and left for the vultures, who can’t metabolize mercury. Clement Hil Goldberg makes charming cartoons about singing mushrooms who take over Earth after the demise of humans, a narrative Goldberg links to the mushrooming of multiple sexualities. Tsing’s is an aesthetically beautiful book, replete with black and white photos and line drawings. It is nice to hold it and open it, as nice as one expects a matsutake mushroom to be for a fan of such mushrooms. It’s an aesthetic that somehow is influenced by the mushrooms themselves, like Jae Rhim Lee’s. Björk and I have written of the unhelpful prominence of big budget disaster nihilism. We need to crawl out from under that stuff. And we can. Jane Bennett wrote of the “small agency of worms” as she puts it, following Darwin, in her massively suggestive Vibrant Matter, and with The Mushroom at the End of the World, Bennett’s vibrancy (of subject and style) and attentiveness to small agency is definitely a call to which this book is a breathtakingly uplifting, refreshing response. Something is growing out of the cracks in modernity’s sidewalk. Modernity has made life precarious, but this very precarity (as Tsing puts it) can become a political tactic that speaks to an ontological truth: things are inherently fragile. The mushroom cloud of modernity (and modernity-speak) gives way to the emergence, with a smile, of the matsutake mushroom and its fragile groups of allies. Timothy Morton is Rita Shea Guffey Chair in English at Rice University. He gave the Wellek Lectures in Theory in 2014 and has collaborated with Björk, Haim Steinbach and Olafur Eliasson. He is the author of Dark Ecology: For a Logic of Future Coexistence (Columbia, 2016), Nothing: Three Inquiries in Buddhism (Chicago, 2015), Hyperobjects: Philosophy and Ecology after the End of the World (Minnesota, 2013), Realist Magic: Objects, Ontology, Causality (Open Humanities, 2013), The Ecological Thought (Harvard, 2010), Ecology without Nature (Harvard, 2007), eight other books and 150 essays on philosophy, ecology, literature, music, art, design and food. He blogs regularly at Ecology without Nature. 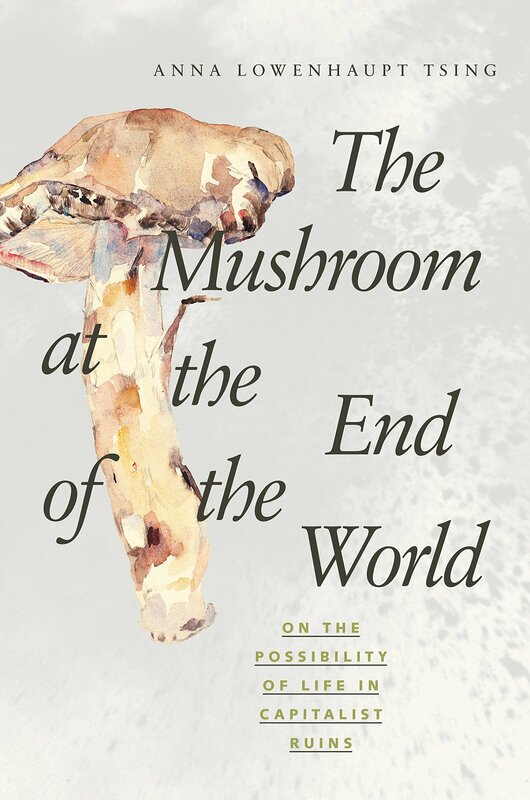 Morton T. Anna Lowenhaupt Tsing’s “The Mushroom at the End of the World: On the Possibility of Life in Capitalist Ruins”. Somatosphere. 2015. Available at: http://somatosphere.net/2015/anna-lowenhaupt-tsings-the-mushroom-at-the-end-of-the-world-on-the-possibility-of-life-in-capitalist-ruins.html/. Accessed April 20, 2019. Morton, Timothy. 2015. Anna Lowenhaupt Tsing’s “The Mushroom at the End of the World: On the Possibility of Life in Capitalist Ruins”. Somatosphere. http://somatosphere.net/2015/anna-lowenhaupt-tsings-the-mushroom-at-the-end-of-the-world-on-the-possibility-of-life-in-capitalist-ruins.html/ (accessed April 20, 2019).